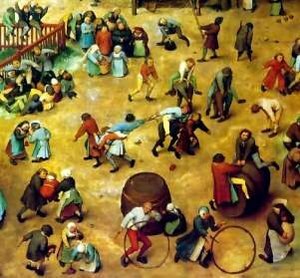 A late 19th century stroll through the open spaces in German towns may have brought you face to face with a group of laughing children engaged in the fast-paced game of Iron Tag. This is according to the writings of philosopher, teacher, and folklorist William Wells Newell. Newell, who is best known for founding the American Folklore Society in 1888, had a particular interest in the habits of belief he found among children. His book Games and Songs of American Children published in 1883 explores the persistence of folk beliefs that have leaked into the imaginations of children and manifested as imaginative play. 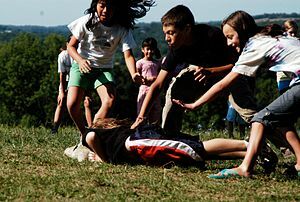 Among the discussion is a description of the classic game of tag pretty much as we all know it still today in which a selected “it” must chase and tag the other children, whose job it is to stand on base and relentlessly tease their hot and sweaty pursuer. Newell traces the origin of the game to the “original form” of iron tag, which according to him was still common through Germany and Italy in his day (apparently American children had already moved on to the highly advanced “Toilet Tag” version). Iron tag, as the name suggests, declares that the pursued children are safe as long as they are touching something made of Iron. This is of particular interest to a folklorist because of an ancient superstition that iron is a great source of protection from evil. The belief is prevalent across many cultures probably because the highly useful element occurs naturally in large quantities in the earth, because blood (the life force) contains and smells of iron, and because the wearing of an iron suit powered by a fictional inexhaustible energy source makes one a virtually invincible superhero. According to Newell, the “it” in a children’s game of tag represents an evil spirit from which the pursued children must escape, mostly because he is quite the risk taker given that he recently caught a tiger by the toe leading his mother to sock your mother right in the nose. Newell’s point is a good one, I think. Folklore, he argues, is not merely the realm of adults, but also influences the lives and creativity of children, which we can see in the history of the way even silly games (except of course for “toilet tag” which is serious business) have developed over time. Where I think he’s wrong is in his assertion that “iron tag” was the original form of the game. It turns out it’s not actually so easy to trace the history of tag. I suspect this is because the game is more or less innate (kind of like Monopoly). 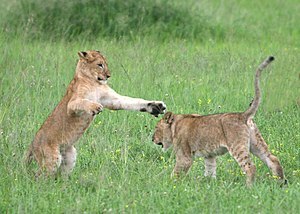 We can see lots of young animals engage in tag-like play as they are learning life skills like pouncing, escaping, and irritating the adults in their lives. Human children, too, seem to play versions of tag as soon as they are old enough to chase. And I have it on good authority that the assassination of Julius Caesar and the eventual fall of Rome was really just a byproduct of a game of tag gone wrong. If you want details, you can check out the insightful and thorough treatise on the subject by The History Bluff (who’s blog is nearly as authoritative as this one) here. But however the game began, it has persisted through the ages and emerged as just plain old fashioned fun. There’s even a group of ten friends from Spokane, Washington who have been engaged in a single game of tag for twenty-three years even though they are now in their forties and living all across the country from one another. The men say the reason they still do it is because it keeps them in touch with one another and fosters lasting friendships among them. While the rest of us scrape by making the occasional comments on photos of our growing families on Facebook, these men actually fly across the country in order to tag the next “it,” thereby turning this childhood game into the great force for networking and relationship building it was probably always intended to be. I say this because I recently had the honor of being tagged in a similar game. No one caught a plane and hid in my trunk awaiting my arrival so that they could hand off the terrible burden of being the slow kid. Instead I was “tagged” by a fellow blogger and writer with some questions to answer and pass on to three lucky new “its,” specifically writers who have blogs. First I’d like to say a big thank you to Donna Volkenannt who is the winner of 2012 Erma Bombeck Global Humor Writing Award and the genius behind the blog Donna’s Book Pub, which is a great resource for writers. Donna claims that she just brushed my arm with her finger tips, so, you know, whatever. I guess I’m it. I am in the process of seeking representation and publication for my first historical novel, the story of a fortune-teller from 19th century New York State with a troubled past, a unique talent, and a secret with the potential to unravel one of the most successful deceptions in US history. In the mean time, I have returned my attentions to short fiction and essay as I research my next novel which will center on a movement among some American abolitionists to establish the nation of Liberia. I’ve found there is a lot of variance in historical fiction, but that it basically boils down to two ends of a wide spectrum. On one end are the novels that closely follow the life and story of a known historical figure. The other end of that spectrum would be novels that take place in a particular time and place, but that include only wholly fictional characters that are drawn from the details typical of people from the era in which the author has placed them. My first novel fits between the two. My main character is entirely fictional, though throughout much of the novel she interacts directly with a known historical figure and her experiences include actual historical events and people. I chose this approach for this particular project because my character has discovered the “smoking gun” in a historically significant conspiracy theory for which there is no known resolution in scholarly writing. Since I was faced with offering an explanation that history itself has never revealed, I thought the best vehicle for doing so would be a character who is a representative of her era rather than a real-life participant in it. I write the kinds of things I like to read. I most appreciate fiction that re-introduces me to a world I thought I knew and makes me look at new details that draw connections I never suspected before. I think that’s why I’m so drawn to historical fiction because it immerses me in this world that is familiar, but that I’ve typically considered only through the lens of my own contemporary perspective. When I experience it through a cast of fictional characters, suddenly I find myself immersed in the era and attempting to bridge the gap between my experiences and knowledge to that of a person (whether based on a real person or simply drawn from the era) who approached the same story with an entirely different set of circumstances than I did. My favorite fiction makes me want to do my own research. I write what I write because I would love to inspire that desire in others. I think the hardest part for me is generating that first, terrible rough draft. Most writers, I think, will agree with me that the real work on a story begins when the rough draft is over and the revision starts, but you never get to that part if you don’t first get the thing written. It can be really uncomfortable to return to an unfinished draft to forge ahead with the story when I know darn well that what I’ve already written is full of obvious holes, lazy word choices, and even the kind of bad grammar that would embarrass me right out of the industry. Still, forge on I must, because until I’ve written that overly sentimental ending that I will most certainly change later, I don’t stand a chance of completely restructuring the first chapter. I totally got you! Oh, and, of course, no tag backs. Pingback: American Touch Tag Day | Crow Arrow, Inc. Seriously, how did I not know that this was American Touch Tag Day? Fantastic! I love it when it all comes together. Get out and play a game of tag, everybody! Very interesting, Sarah! Thanks, but I can’t play in cyberspace til next week! Check my answers then! No problem. There’s no hurry. I look forward to reading your answers! I love this post. It is informative and entertaining. Thanks for playing tag with me. I have to mention that when I was a kid in St. Louis we played a game called “first on streetlights.” It was tag with a twist. The last person to touch the concrete streetlight on our corner was “it.” I’m certain there was some iron in that streetlight somewhere. It’s good to know that iron tag is alive and well!